The mists and mellow fruitfulness of autumn are fading rapidly into winter, and we are left with piles of damp leaves, the scent of bonfires and one, rare, plant to remind us of the heady days of summer: the Chrysanthemum. Like many gardeners, I have come late to the pleasures of chrysanthemums. Horrified by the cellphone-wrapped specimens on garage forecourts and wary, if I’m honest, of a plant called, simply, ‘Mums’, I had given the genus a wide berth. To round off my feelings of aversion, I had the idea that they were temperamental and difficult to grow. But prejudice and ignorance were swept away a few years ago on a visit to see National Collection of Hardy Chrysanthemums. In my own garden the Asters were already blackened by frosts and the Dahlias a pile of mush, so I was sceptical of seeing anything of interest as I trudged through the November cold. And then, there they were, sparkling in the clear, crisp light: row upon row of jewel-like flowers, flashes of russet, red, and copper, the mantel of autumn, and, incredibly, the pinks, clear whites and sunshine yellows of summer. All withstanding the first frosts, clearly hardy and easy to grow. Hallelujah! I was converted. So, why is it that Chrysanthemums have been so neglected over the past fifty years? During the early 20th century in France, and in Britain in the 1920s and in America in the 1930s, plant breeders were busy producing dozens of new varieties that were hardy and easy grow. By the end of the 1930s, they were the most popular herbaceous plant in British gardens. But with the advent of the Second World War most flower gardens were turned over to vegetable production and, with nurseries also digging for victory and no national plant repository, many cultivars of herbaceous plants were lost. Ironically, because of its popularity, the chrysanthemum family suffered more than most. The varieties that did survive were predominantly those that were commercially valuable as cut flowers or those that were grown by Chrysanthemum enthusiasts for flower show competitions. Both types need mollycoddling and fretting over, and are of no practical value in the harsh world of the garden. A generation of gardeners, which includes myself, came to believe that chrysanthemums were fussy, fragile and difficult to grow, and it is only recently, thanks in part to people like National Collection holder Judy Barker who have tracked down old, hardy varieties, that we can once again appreciate this late-flowering marvel. There are two main groups of hardy Chrysanthemums: Rubellum hybrids, thought to descend from C. erubescens; and Korean hybrids, thought to descend from C. koreana. So much hybridising has taken place that is impossible to identify each group’s parentage. One thing that can be known is that both groups have a lineage of vigorous and hardy plants. Breeding of Rubellum types began in Britain in the 1920s and continued until the outbreak of war. In 1939 the nursery of Amos Perry in Middlesex produced C. ‘Clara Curtis’, which has pink, single daisy-like flowers and grows to about 70cm tall. It starts flowering in September and is usually worn out by November. A plant with similar flowers that can pick up the baton from Clara is C. ‘Carmine Blush’, which will start flowering at the end of October. C ‘Emperor of China’ is a far older Rubellum type, dating from the 1880s, when it was championed as a good garden plant by William Robinson. Like C.‘Carmine Blush’ it has soft pink flowers but this time with spoon-shaped petals and a crimson central boss. It reaches 1.2m tall, which means that it does have to be staked. As the temperature drops, its leaves turn a burnished deep red and mahogany colour. 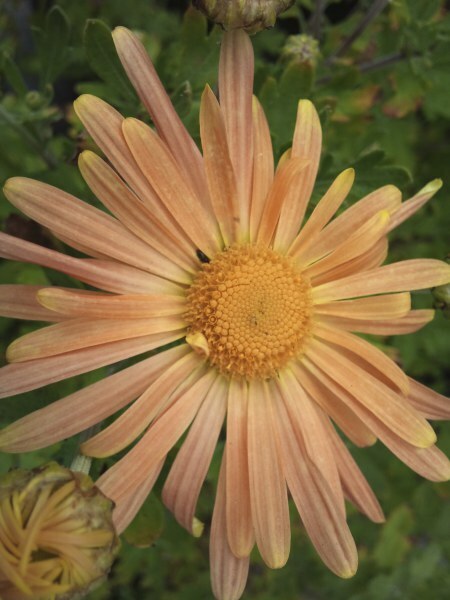 Retaining the same daisy-shaped flowers, but with peach-coloured petals, is C. ‘Mary Stoker’. This was also bred by Amos Perry and is a very floriferous plant, about 70cm tall. The brightest Chrysanthemum with daisy-like flowers is C. ‘Breitners Supreme’. This is a more compact plant, 45cm tall, with sparkling-white flowers. The Korean hybrids were developed in the United States during the 1930s by a Connecticut breeder, Alex Cummings. One of the plants he used in his programme was C. koreana, which had been collected by the famous plant hunter Ernest Wilson while on an expedition to northern Korea for the Arnold Arboretum. In general, these hybrids are shorter and bushier than the Rubellums. C. ‘Ruby Mound’ has deep-red double flowers and grows to about 45cm tall. Slightly taller at 55cm is C. ‘Wedding Day’. White petals surround a yellow-green centre, fading to cream as the flowers age. Chrysanthemums with flowers the colour of autumn are perhaps the easiest to place in the garden. C. ‘Paul Boissier’ has sprays of semi-double bronzy-orange flowers that look good growing with the darker bronze flowers of C. ‘Chelsea Physic Garden’. Both are strong, upright plants about 80cm tall and both make good cut flowers. I’ve not tried it yet but I think that adding C. ‘Ruby Raynor’ to the group would make a perfect trio. Its double flowers are a dark golden-yellow, the colour of birch leaves before they fall. As with any genus, you quickly find out which cultivars suit your own garden best. The two that I like most are both low-growing, domed plants about 50cm tall that echo the shape of the dark-leaved sedums that surround them. C. ‘Mei-Kyo’ is covered with small button-shaped mauve flowers; C. ‘Nantyderry Sunshine’ has similar flowers which are, as its name suggests, a sunshine yellow. They are so improbably healthy and happy when nearly everything else has finished that they put a smile on your face even on the most miserable of late-autumn days. And they stand as a reproach: to never again ignore an entire genus through snobbery, ignorance or, in fact, for any other reason.